A variety of marketing approaches and tactics is helping Comcast Business connect with a wide range of B2B target customers. Historically, Comcast took a “one size fits all” approach to marketing, but is now looking at more integrated campaigns with coordinated touches, appending prospect data with online behavioral data to score and prioritize leads. It is also using ABM and influencer strategies to reach a wider range of stakeholders. 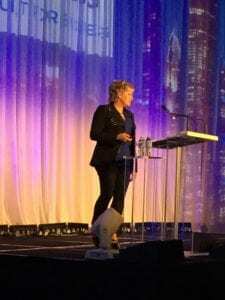 “We need to tap not only into the CIO and the decision makers but the influencers of the CIO as well, who care what transformative technology can do for their business,” says Denice Hasty, senior vice president and CMO, Comcast Business, who spoke at the ANA’s Masters of B2B conference this week..
Comcast has 2.2 million business customers, in addition to 29 million+ cable customers, and generates $85 billion in annual revenue. Over 10,000 employees are dedicated to Comcast Business, which generates over $7 billion in annual revenue, up from $256 million in 2006, and for fiscal year 2017 reported 12.8 percent YOY growth. One issue the brand has had is the fact that it hasn’t always had the best reputation for customer service on the consumer business side, and it needed to change that. Comcast studies the introduction of a Gigabit-speed network, to see what impact it would have on consideration for business customers. They wondered if customers would know what it was, and understand what it could potentially do for their business. Research showed that 90 percent knew Gig meant fast, they didn’t know much more. But, 59% said offering Gig speed had a positive impact on how they considered the technology of a provider, and those who weren’t sure they needed it still saw it as a sign of reliability. “There was a halo effect,” she says, noting 48 percent were willing to purchase Gig speed at a premium over current Internet speeds. Comcast Business has a share of the wireless backhaul business as well, where it helps mobile carriers increase bandwidth and help transmit network data over alternative wireless routes. AT&T and Verizon don’t want to work together on that business because they were competitors in the mobile carrier space. But, she notes, in this instance Comcast could can come in like Switzerland and connect the two. The company is increasing its investments in digital platforms, but also uses more traditional marketing methods, like direct mail, which generates both calls and online leads. But no matter what vehicles you’re using to connect with consumers, brands must know what is moving the needle. Comcast is also testing different types of placements, such as podcasts, NPR sponsorships and a partnership with “Shark Tank,” where it supports local casting calls. “It’s a great way to show we support entrepreneurs,” she says.